Welcome to Contro Short stories including: Prequels to You Wish, Sequels to Dirty Money, and Contro's Finest. Before Willis, Arthur, and Lily found Smoke - Jahvari arrived on Earth alongside Scorpra to find their friend first. These are the events set in motion leading to the discovery of Smoke. Wilfred is a depressed Vampire with no special abilities other than not being able to die. He has successfully set up a night club called Fire and is constantly harassed by a local werewolf gang led by Barry Milick. 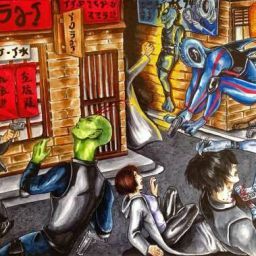 The stress of running a club occupied with sentinels and humans, a prostitute girlfriend, and constant attacks leads him on the search for a new business partner. Jahvari and Alexander are hightailing it out of their sector of the universe with the sentinel Scorpra to find their friend Smoke and make sure he&apos;s okay. Smoke has a huge bounty on his head and other forces are working diligently trying to find him. David has started sorting his life out and put his career and healthy lifestyle as priorities much to the dismay of his friends Willis, Arthur, and Lily. After being convinced to relax and enjoy himself like old times David and friends set out on a wild night - a night that would change their friendship forever upon making a discovery.